This is one of the best set/series of books I have read since "Twilight". The part that makes it better is there aren't just werewolves and vampires, there is much, much more! I mean L.A. Jones adds in an entire hidden world that is so in depth, you can almost imagine it could be true in real life. There are faes/fairies, shape-shifters, vampires, witches (in this case just one living one), and much more. I really thought it was amazing when Liza and her husband found Aradia in a cave, she immediately knew she was different, she was a true mother, whether she was biological or not. The same goes for Aradia's father, he was immediately the beautiful little redhead's father. This truly makes me believe that they were meant to find Aradia, that's why she was sent away, because her people wanted to get anyone to survive the unjustified slaughter. But, it makes you feel like that particular couple was meant to find her, like it was fate. Then, like most children, she felt different, but she actually was. I think this is why people didn't accept her until she moved to Salem, because they are scared of what they don't understand. When she moved to Salem, she actually fit in, which was a first for Aradia. She slowly starts to realize Salem is different, just like she is. Finally she finds out she is part of this hidden world when she meets Roy. I love the way that she took care of him, whether he tried to kill her or not. That is a true friend, her knowing it was him, even when he was in his wolf form. Her taking charge and going after Dereck because of the people who he killed, as well as befriending his werewolf son, just to get justice. I think it was amazing how L.A. Jones went in depth on how the hiddens adapted, how they were created (if they weren't born that way). Especially, in the fifth volume, when she describes how a gargoyle was created. Most books just say the basics when it comes to how a non-human is created, but she makes it believable. The bat DNA and the vampire DNA, that was absolutely ingenious! I also love the way she makes it to where it's almost impossible to put these books down, she makes you want more and more. Basically, this book is like an illegal drug, totally addictive! I am a total "Twihard" but, these series of books puts "Twilight" to shame. I honestly cannot wait to see the next installment. These characters have so much depth, when you get done with the fifth volume, it's like you can't see your friends until the next book is released! I love it though, if I had my way, it would be a movie, or at the very least a television show. This is an amazing series, go out and get it, you WON'T be sorry, I promise you that! Now, I would like to welcome an AMAZING author and a good friend of mine, L.A. Jones. She's been kind enough to give me an interview. She's an amazing person too, check out the interview below! This is my review of the series "Tales of Aradia The Last Witch" volumes 1 through 5. I want to stress this series is NOT done, I am reviewing the books that have been published so far. The next installment will come out the summer of 2013. - LAJ: One of the most notable experiences I had which sort of indicated how big a role story telling would play in my life when I was being privately tutored by a wonderful woman named Ms. Lynch. She would allow me to tell her stories as a reward for when I finished my lessons or did really well. When I left Sri Lanka, she gave me a hand stitched photo with "Once Upon a Time" written on it with blue thread. This sort of symbolized to me how big being a writer or at least a story teller would be for me. 2. Does your family and friends support your writing? - LAJ: My little sister once told me that when we were little she loved playing with me because I would come up with very imaginative games. However, I didn't actually start writing anything until I was in middle school. I did stop though for awhile but it worried my parents so much that it finally began to occur to me how important my writing was. 3. If you weren't a writer, what career would you have chosen? - LAJ: There were actually several careers I would have chosen if I hadn't become a writer. I would have wanted to be an actress, therapist, teacher, or businesswoman. However, my father still hopes one day I will become a teacher. Education is a very high value in my family. 4. Where did you get the idea for the plot of your story? 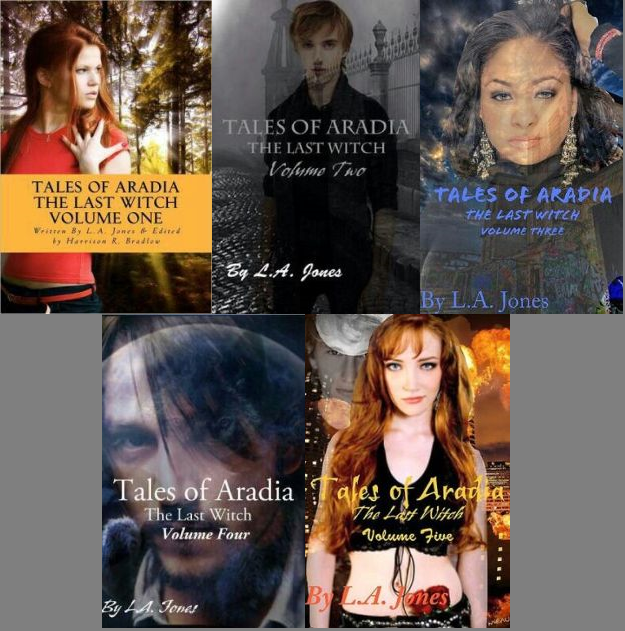 - LAJ: The plot for my book series "Tales of Aradia" is actually based on a lot of real life concepts like prejudice, genocide, politics, and making your own path. By using fantasy, I can explore real life touchy subjects like religion and politics without insulting anybody. I like fantasy as much as the next person but nowadays there is no sense of realism. I figured that I might as well try to bridge that gap. I use fantasy but I use a lot of realistic situations, humor, and people. 5. Where did you get your idea for your characters and are they based on real people? - LAJ: I base my characters on people I meet. In order to give my books the sense of realism I want I base my characters on people in my life. People such as my teachers, family, and friends. 6. (If you can tell me/us), what will your next work be about? - LAJ: I have discussed things with my editor and he and I are debating on whether or not we should make our series on aliens next. Ever seen "Ancient Aliens"? It's a very interesting TV series which has given me a lot of good ideas. I think Harrison and I might base our next book series on that. - LAJ: I have read many books in my life but in the end I must always say that my favorite book will always be "Matilda" by Roald Dahl. I worshipped Matilda when I was little. The fact that she could read when she was 2 was so inspiring. Most of all, I admire the way she triumphed over her enemies. - LAJ: My 2 favorite book genres are historical fiction. Why? Because I like that added input and insight from the writer in the historical period. Like the book "The Other Boleyn Girl", it was so fascinating (but cruel) how women were treated back then. - LAJ: I come upon an idea and I write it down. After a while I develop it to make sure it's original and try to develop concepts and characters. 10. What was your favorite book that was turned into movie? - LAJ: "The Hobbit" and "The Lord of the Rings". The special effects were so amazing and it stayed so true to the books. This is a wonderful series, go out and buy it on Kobo.com or Amazon.com! I would like to thank L.A. Jones for taking the time to do an interview with me. I know she will be so successful, maybe even outdo Stephanie Meyer? I think so, especially if her books get into the right hands! As for me, thanks for reading my review and take care! Keep On Reading! Thank you chica! It is a wonderful series, and there are still 5 more installments. When it's finished there will be 10 books in all, in the series! I can't wait for the next one, #6 comes out this summer, as I stated in my review!